A lot of my recent sewing projects have been for my kids. Jeans and t-shirts, mostly. I can’t believe the lengths I will go to to avoid clothes shopping. 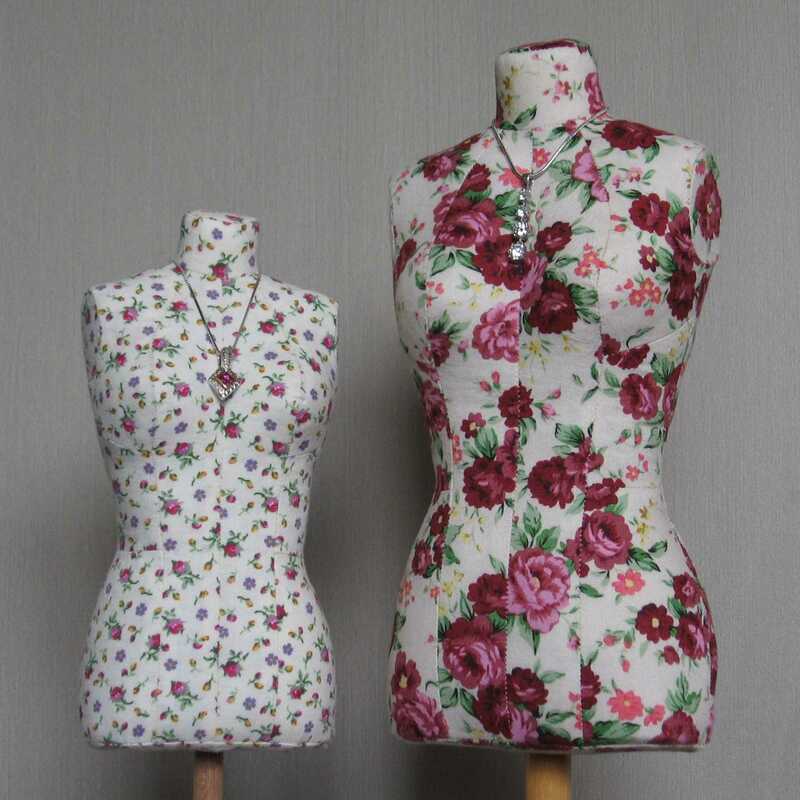 I would so much rather be doing selfish sewing, but then my kids need clothes and I end up sewing them. I do have a good reason for sewing jeans for my kids, though. They both inherited my round rear end, and I don’t want them to end up with the posture problems I have have had from wearing poorly fitting clothes. I am convinced that growing up wearing poorly fitting jeans is one of the major reasons I have such a bad swayback. I’ve always had a generous, round rear end, so ready-to-wear pants are always too tight across the seat, with lots of extra room at the back waist, but pulled tight at the front waist. I realized that I tilt my pelvis to relieve the tightness across the front of the pants at the waist, which resulted in my swayback. I remember standing like this at a very young age and having my mother tell me to stand straight. I just couldn’t do it, though. One day I was thinking about how my mother has a similarly shaped bum, but she has better posture. I realized that the reason she doesn’t have a swayback is probably because, despite being a tomboy, she grew up wearing dresses! She wasn’t allowed to wear jeans to school until some time in high school. It’s too bad I didn’t like wearing dresses as a child – maybe I would have better posture now. 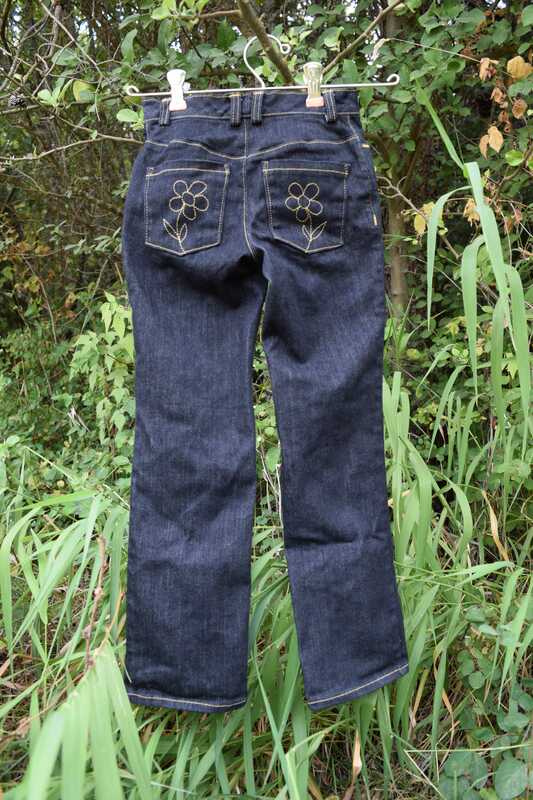 I just made two pairs of Jalie stretch jeans (#2908) for my daughter. I love the incredible size range Jalie has on their patterns. Jalie patterns are so good when you are sewing for growing children. I made a pair of these jeans for my daughter just a few months ago, then already had to go a size up for the ones I just made. Also Jalie doesn’t skip those tween sizes that are hard to find in big 4 patterns. I learned the hard way that even kids need to have their clothes fitted. I made a muslin before I made my daughter’s first pair of jeans, and had to let out the waist at the sides and take in the back yoke. It is so much easier to make alterations on someone else! Usually I’m struggling to fit myself. I also made the waistband narrower and changed the leg style – instead of flares, I made them straight from the knee down. When I was sewing on the front pockets on one of the pairs of jeans late at night, I accidentally swapped the left and right pocket backing pieces and sewed them in wrong side out. 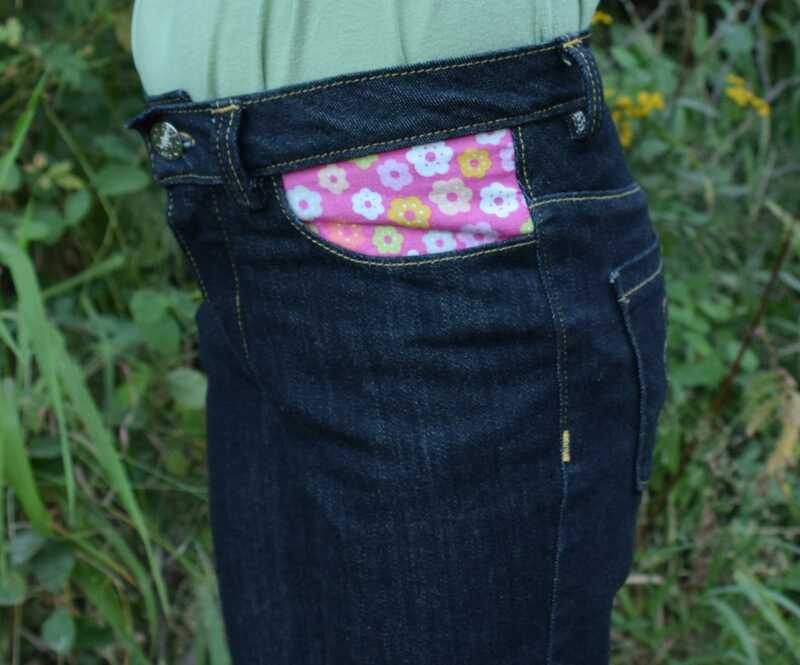 I had serged the pocket edges before I noticed, and I didn’t feel like unpicking them, so I asked my daughter if she was OK with the flowered pocket lining fabric facing outward. She was, so I decided to pretend I’d done it on purpose. Do you know what she just told me? This pair is her favorite pair of jeans! 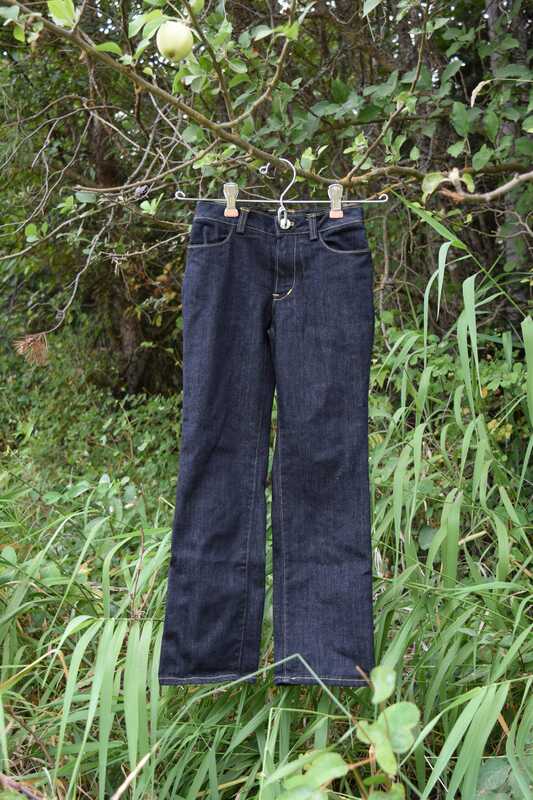 I’ll have to make some more jeans with contrasting pocket backings – on purpose this time. Those jeans look so good! I have never tried to sew jeans. That contrasting pocket facing is so cute too. Maybe you have started a new fashion.